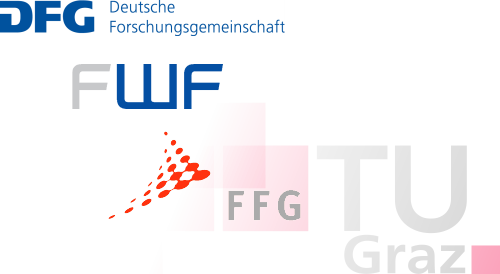 Many of the current projects running at the ICTM are funded by third parties such as FWF, FFG, DFG, European Union as well as the Christian Doppler Research Association (CDG). The CDG promotes the cooperation between science and business. Specifically, this takes place in specially established research units with fixed terms, in which application-orientated basic research is pursued. Currently, the CD lab for Lithium Batteries belongs to one of the largest third-party funded projects at the ICTM. It is subdivided into two modules that focus on (i) ageing effects and solid state electrolytes as well as on (ii) microbatteries with crystalline Si as anode material. Industrial partners are AVL and Infineon Technologies. Pure fundamental research is carried out in several FFG-funded projects such as SolaBat. SolaBat's main objective is to develop a hybrid energy System that combines a solar cell directly with a Li or Na ion battery. In the frame of the DFG Research Unit molife, research is devoted to the study of Li ion dynamics in various solids such as single crystals, nanocrystalline materials and amorphous oxides. DFG SPP 1415 "The mechanochemistry project"